Babi Panggang or “roasted pork” is served with different types of sauces in different regions. The version we know is made with the Cantonese tomato, ginger based sauce. 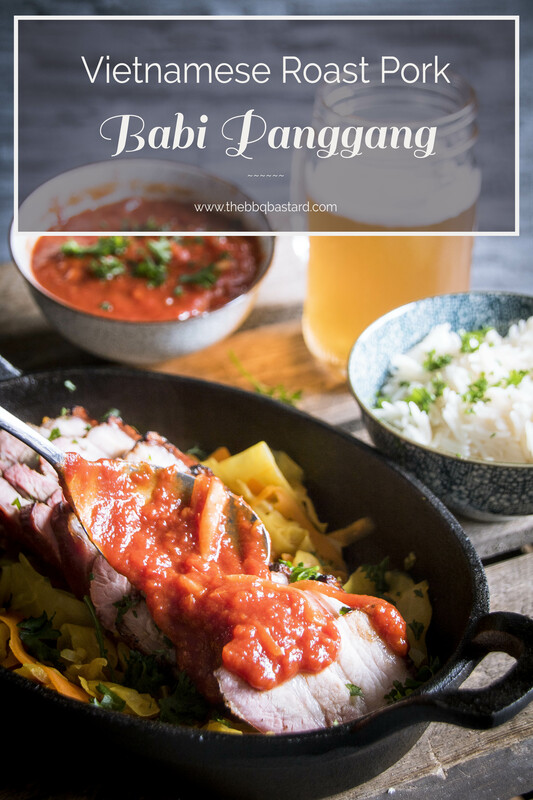 For this BBQ Babi panggang I used the same sauce. Because it’s that sauce which made me fell in love with this meal. You can make it on the BBQ but I tried it before and it wasn’t what I expected. When catching smoke the sauce tends to distract the tastebuds from the sweet and sour taste. In my opinion it tasted much more like the well known BBQ sauces. So I suggest you make the sauce in a BBQ without additional wood smoke or on a sideburner of the gas grill. The BBQ Babi Panggang is served with some homemade Atjar Tjampoer. You can buy yourself a can of Atjar Tjampoer but it’s really not that hard to make. So why shouldn’t we make it ourself? Atjar Tjampoer are pickled vegetables. Mostly cabbage and carrots. For the pickles you can find some different recipes. I chose for one with cider vinegar and ginger. Flavors complimenting the taste of the pork belly and Cantonese sauce. 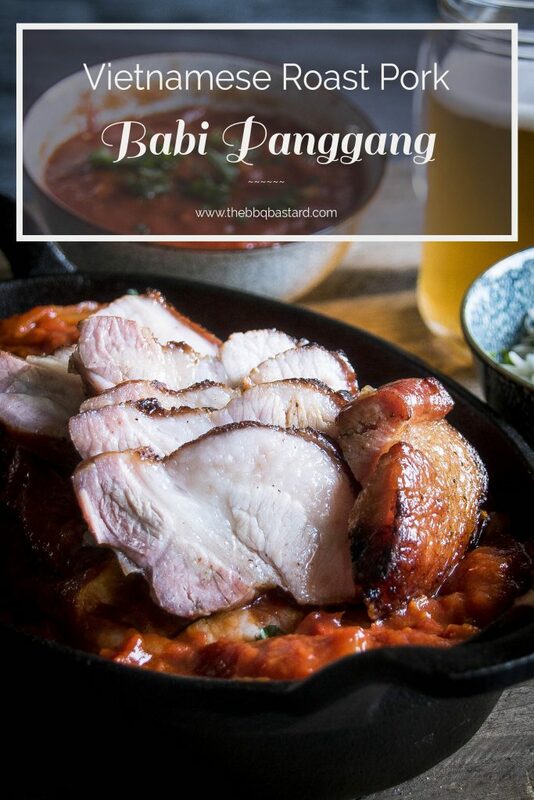 Thank you for stopping by for this BBQ Babi Panggang recipe! I hope you leave a message in comments below or through social media sources to share your thoughts and cooking experiences! Being a bit of a thrill seeker I would love to see my posts go viral! But I need your help for this! Click and share to your mates and tell them to spread the word! 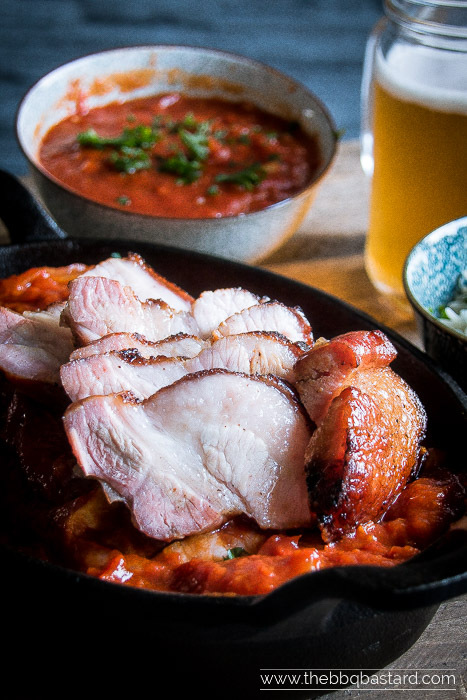 Or just join us on Facebook for a chat on beer and bbq! Over here in Belgium Babi Pangang is sold in the Chinese restaurants (number 51 for those who care)! It's my favorite. 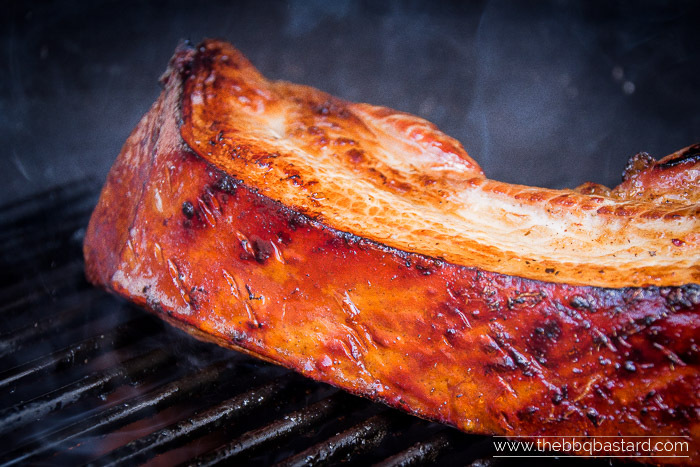 So it's time to make this indonesian roast pork meal on the BBQ! It's awesome and actually not that hard to make yourself! So go ahead and make nr. 51* BBQ Babi Panggang yourself! Atjar Tjampoer pickled vegetables: 1 day ahead! Quarter the cabbage and finely shred it! Finely slice the onion and carrots. Sauté the onion vegetable oil for about five minutes. Add the finely grated ginger and garlic. About 5 minutes later when the onion is soft and fragrant add the cabbage, sugar, turmeric, salt, vinegar and water and bring to boil while stirring. Cover the pan and lower the heat. Let simmer around the boiling point for about 30 minutes. The cabbage should be tender with a bite. Taste and add some salt, sugar or vinegar at your taste. Prepare the dry oriental dry cure (recipe here). Thouroughly cover the pork belly with oriental dry cure for 2 hours. 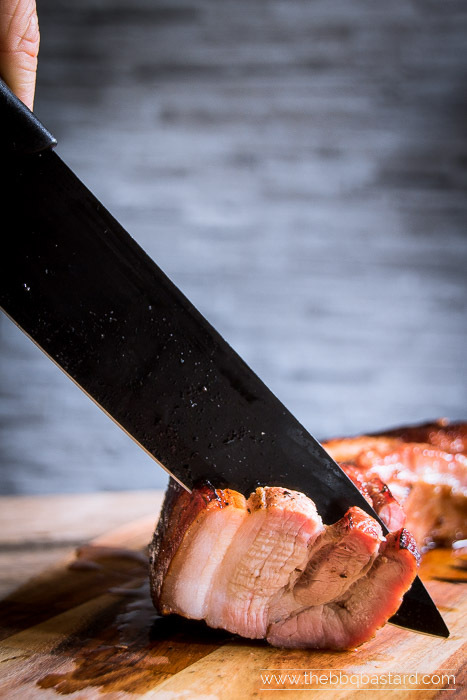 Rinse the pork belly thouroughly with water for 5-10 minutes. You need to do this carefully because otherwise your belly will taste very salty. Pat the belly dry and poke some holes in the skin. Baste the skin with vinegar. This should make the skin crispy in the cooking process. Dry the cured pork belly for a day in the fridge. Prepare the BBQ for indirect cooking at low temperature (110°C/230°F). I used a platesetter in my kamado for this. Add the smokewood and wait until the smoke turns blue. Crank up the heat of your BBQ and remove the platesetter so you can cook on direct fire. Time to make a crispy skin by roasting the belly skin side down on the high heat source for a couple of minutes! Watch out for the fat drippings in the fire. Flare-ups are not a drama but the meat shouldn't be too long in the flames. Now this is easy! 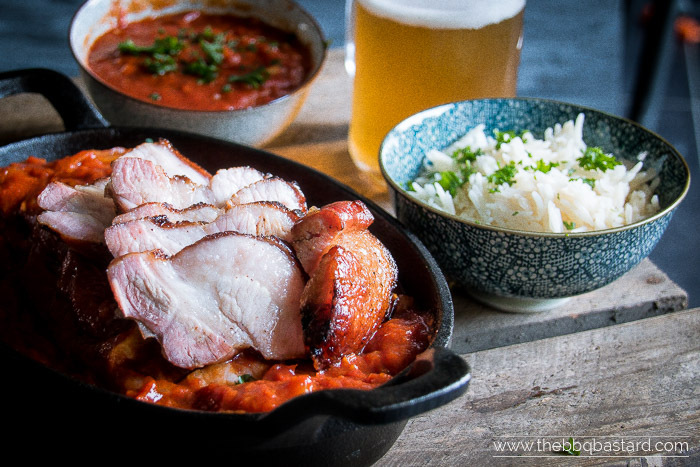 Mix all ingredients and bring to a boiling point. If you want less heat in the sauce start by adding half (or less) of the sambal. You can always add more afterwards. Return the heat and let simmer for about 30 minutes until the sauce is nicely thickened. Looking for Ginger paste or ketjap manis? Taste and add ingredients at taste if needed! Serve with rice and have a great meal! - There are affiliate links on the "Apple wood chunks", "Sambal oelek" "Ginger paste" and "Ketjap Manis".